“SOCIALIST FUN-TIMES”: ​WATCH MY 2016 SHOW FOR FREE! 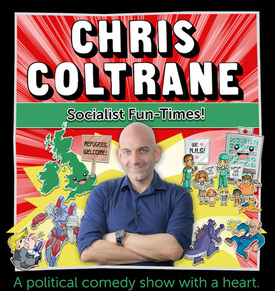 Socialist Fun-Times is my most recent stand-up show – and if I do say so myself, I think it’s my favourite one I’ve ever done. If you’ve been looking for some comedy that defends refugees, holds Donald Trump to account, champions political correctness, attacks comedians that lie to their audience, and leaves you feeling like we can possibly make the world a better place, then this is the show for you. This recording happened at The Phoenix, in London’s Oxford Circus, thanks to the gorgeous people at Turtle Canyon. You can stream it at YouTube. Or, if you’d rather own the actual video file, pop me a donation on my Donation Page and leave me a note saying you’d like a copy of it! Pay whatever you think it’s worth. Anything from £2 to £20, or more if you can afford it – or less if you can’t! Either way, it all goes to helping me make more biggerer and betterer comedy, especially for you.